When West Linn voters approved a general obligation (GO) bond to fund an array of city projects in May, they placed a certain level of trust — roughly $19 million's worth — in the City to follow through on improvements that were promised in infrastructure, parks and city facilities. And City officials haven't wasted time: Bonds were sold Aug. 21 to secure funding and the City has also issued a request for qualifications (RFQ) in search of a design firm for streetscape improvements in the Willamette area. The latter step, however, caused a minor stir on social media as some residents worried that the concept plans shown alongside the RFQ had already been finalized without public input. That's not the case, according to Public Works Director Lance Calvert. "We drafted a concept plan that matches what's in the schematic plans of the (previously approved) Transportation Systems Plan," Calvert said, "so the design consultants, when they're putting together proposals, have a basic understanding of what we're trying to accomplish." As for timing, Calvert said the goal for the Willamette area transportation project is to select a design firm and approve a contract by the end of the year, then spend the majority of 2019 working on the design plan. "And then I would anticipate going to construction probably in 2020 at the earliest," Calvert said. "So there's a lot of time in the queue for this one." The area is among several transportation hubs in West Linn that are targeted for significant improvements using bond funding. 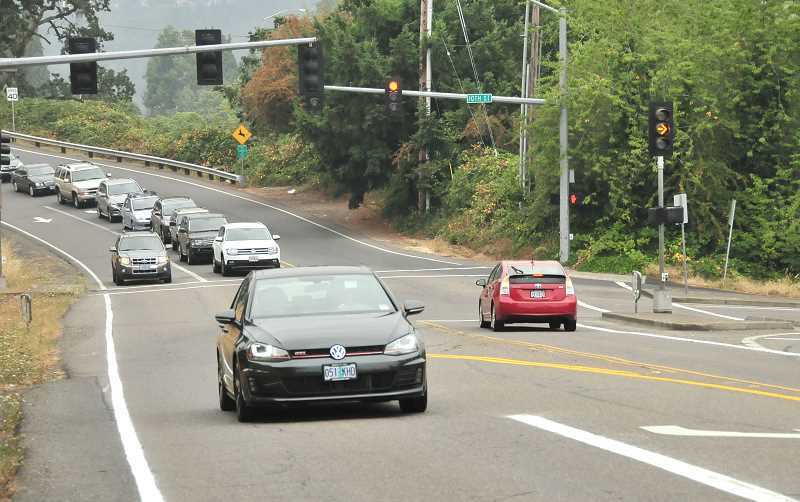 Specifically, the City is targeting improvements on Salamo Road near the congested 10th Street intersection, as well as along Willamette Falls Drive. The concept plan drafted by the City includes new traffic signals, bike lanes buffered by landscaping, sidewalks and curb alterations on Salamo Road and 10th Street. As part of the RFQ, the City also included a concept plan for the Willamette Falls Drive streetscape that was created by the Historic Willamette Main Street nonprofit group. That plan calls for sidewalk alterations, a tree planting strip down the middle of the road, elevated bike lanes and realigned parking configurations. Detailed as the plans might seem, Calvert reiterated that they will simply serve as jump-off points for the future consulting firm. "Even the Main Street plan hasn't been officially endorsed by the City Council at this point, so there's a lot of details to work out and a lot of public involvement and outreach relative to the details of the plan. "The first step is getting a designer on board so we can have good information and be able to respond to people in a positive way." The concept plans can be viewed online at https://westlinnoregon.gov/publicworks/historic-willamette-main-street-and-10th-st-interchange-streetscape-improvements-design.